FOR a racehorse, Perfect Timing has a personality akin to a human prankster. The six-year-old, trained by Joanne Hardy at Coffs Harbour, will be out to trick his rivals in the Hanks Kitchen South Grafton Benchmark 60 Hcp (1410m) on Thursday. "He's a beautiful horse, there's not a person in the stable that doesn't love him," Hardy said. "A kid could lead him but he's got a lot of personality. "He can be cheeky. He'll sneak behind you when you're not looking and try and grab your belt. He thinks he's funny. "He's got a few tricks up his sleeve, lots of personality. He's a real dude to have around the stable." Perfect Timing tackles the 1410m second up after what Hardy described as a "bottler run" first up over 1200m at Tamworth on August 18. The gelding settled well back early before chasing gamely out wide to finish 2.4 lengths sixth to Oh My Papa. 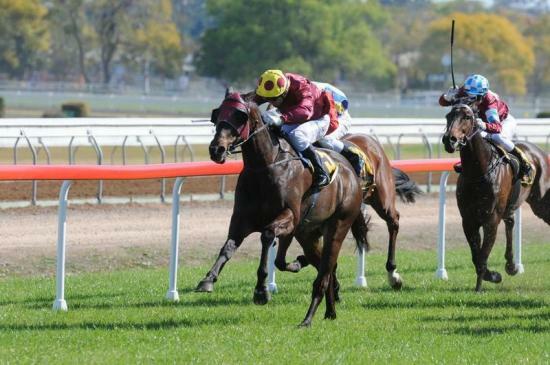 Perfect Timing has two wins and three placing's from nine starts over 1400m and won twice at Grafton. Hardy admitted the gelding's form tapered off late last preparation. "His final run was disappointing so we decided to tip him out for a break," she said. "He's come back good. His first up run was good. The 1200 metres is too short for him. "He got back but was doing his best work late.